How does a Passive House work? Which requirements exist with regard to components, planning, design, and project implementation? What resources exist to help with Passive House design? What is it like to live in a Passive House, what has already been built, and why are Passive Houses such an attractive investment? In order to competently answer such questions, iPHA has created an informational brochure entitled, Active for more comfort: The Passive House. Coming soon in Polish and Turkish! 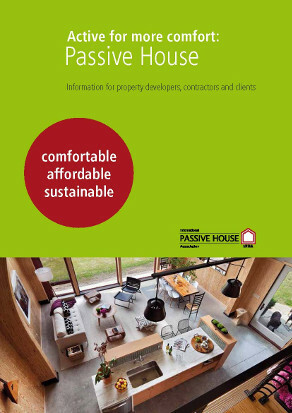 Hard copies of the Passive House Brochure may also be purchased, simply contact us with your request at: info@passivehouse-international.org (Re: Passive House Brochure). German brochures are available through our German Affiliate IG Passivhaus Deutschland. An in-depth handbook with details on step-by-step retrofits with Passive House components as a flipbook and PDF download. Visit the EuroPHit website to download the brochure and find out more about the project. Visit the PassREg website to download the brochure and find out more about the project.